Back on Feb. 3, were pleased to host two Greg Moxness & Charles O’Connell, technologists from a major US defense contractor, who spoke at some length about their predictions for virtual worlds entering the mainstream. 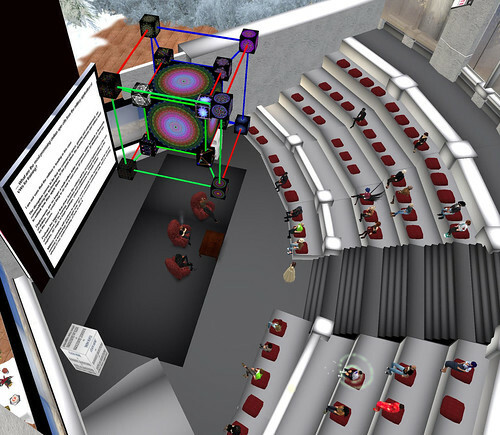 They were not speaking in their role of company employees, but they spoke knowledgeably about how technological advances might reshape 3D immersive environments. I'll summarize some of their points below. You can read the entire transcript here. Greg on neural interfaces like those in Gibson’s Neuromancer: “[M]aybe a step too far. . .maybe 20-30 years but will the human become less and will the machines evolve?” Charles: “a key thing that might happen, if it can be done noninvasively, something outside the body that can monitor brain waves, nerve impulses.” (Iggy’s note to any student readers: from Anderson’s novel Feed, that is the early version of the Feed interface). I look forward to their returning to the Roundtable in 2012.